If you’re a mom of young boys, I’d dare guess that they love Ninja Turtles. My three boys (and even my girl) are obsessed with them! That’s why we chose that for our playroom remodel theme, and it’s coming right along now that I’ve added this Teenage Mutant Ninja Turtles Wall Art! There’s going to be a lot of Ninja Turtle stuff going on, so I wanted this art to be a little less detailed (no eyes) and fun. The boys knew EXACTLY who each of the canvas’ represented, then the PIZZA made it even more ‘rad’, as Mikey would say! Paint your canvases all green, allowing to dry. Use a piece of straight cardboard (or similar straight edged item) to help you do your mask lines – then do one of each: blue, orange, red, and purple. Allow to dry completely. 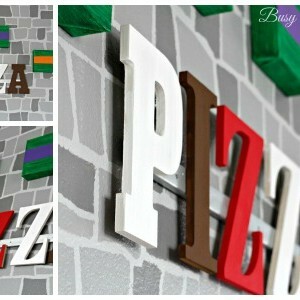 Paint your PIZZA letters, allowing to dry. Use hot glue to attach your letters to a thin board (this is how you’ll mount them to the wall). Let the glue dry completely. Use nails to attach your board to the wall. Use a nail for each canvas to hang those, also. That’s it! Now you’ve got an awesome Ninja Turtle wall display! We’ve got a TON more exciting plans for our playroom remodel, and can’t wait to share them all with you! A super fun themed playhouse (clue: not actually a ‘house’!) is coming up in the next week, so be sure to check back! If you know my family at all, you know we’re HUGE pizza-lovers. It’s especially great to save me some time cooking in the kitchen during a busy day! Whether we make our own or order out, family pizza night is one of our favorites! We won’t settle for ‘good’ pizza, though, only amazingly delicious kinds. When we heard about the new Pizza Hut ‘Flavor of Now’ Menu, we had to give it a try…and were blown away! If you haven’t tried their ‘Flavor of Now’ options, you’re really missing out because there’s items for EVERY taste preference! I couldn’t choose just one when we ordered this week, so got THREE…. This was a pre-designed flavoring which ended up being Hubby’s absolute favorite of the three (my second)! It had their new Hut Favorite Crust Flavor, Premium Crushed Tomato Sauce, Fresh Spinach, Green Peppers, Mushrooms, Onions, Diced Tomatoes and a Balsamic Drizzle to top it off. I will say this was my favorite Crust Flavor…perfectly seasoned and bursting with great taste! THIS one was my very favorite of the three (although I loved all of them!). Also a pre-made Flavor of Now combination, it had the Honey BBQ Sauce, Bacon, Chicken, Onions, new Toasted Cheddar Crust Flavor and a BBQ Drizzle. SUPER yummy! This one I customized, mixing and matching some of their new toppings (there’s 5 new ones! ), crust flavor, and sauce! For this one I chose to try out the Garlic Butter Blend Crust Flavor, Creamy Garlic Parmesan Sauce, Green Peppers, Ham, Mushrooms, Onions, Black Olives, Italian Sausage and Diced Tomatoes. I didn’t do a drizzle on this one, since I thought it was already perfect…and Oh. My. Gosh! It was fabulous! My kiddos downed this one way fast. I also received the most AMAZING customer service! I had ordered the pizza early on in the day for later on their website, and 5 minutes before it was suppose to be delivered I received a call from the manager apologizing that they would be a little late due to so many orders. Guess how late they were probably going to be? Only 5-10 minutes! Seriously, that’s not much, but it was still so generous of them to make the effort to keep us happy and take the time to call personally to apologize. I was definitely impressed! Who else loves a homemade pizza? We sure do, and usually have a family pizza night at least once or twice a month! Instead of doing the same recipe every time, though, we like to try new flavor combinations. This week we tried one of my favorite classic flavorings…Caprese…in pizza form and It. Was. Amazing! So check out our Caprese Pizza to decide for yourself! I’ve tried other things as ‘Caprese’ flavorings, like my want-it-all-the-time Caprese Salad, or even our Caprese Lasagna…yumm-o! 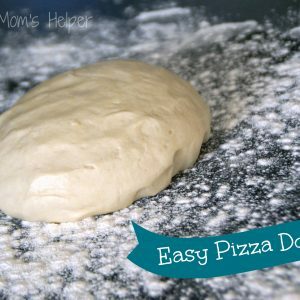 This pizza is no exception to the deliciousness, and I absolutely LOVE how simple it is to make, plus how budget-friendly it is. Bonus! Preheat your oven to 375 Degrees F. Prepare a pizza pan (either spray, or with corn meal, etc.) and set aside. Roll your pizza dough and place on your prepared pan. Brush all the edges with olive oil, to prevent burning. Spread some marinara sauce to within 1/2 – 1 inch of the edge. Top with a sprinkling of cheese. Spread the tomato slices in one nice layer all over the pizza. Top with more shredded cheese, then sprinkle basil on top. Bake for about 20 minutes, or until dough is cooked through. Allow to cool a bit, then slice and serve! 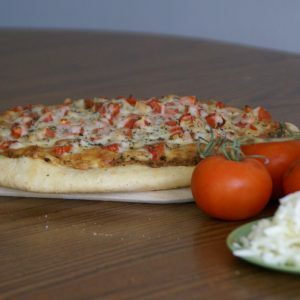 If you’re looking for some other pizza inspirations, be sure to check out our Homemade Chicken Alfredo Pizza, our tangy BBQ Chicken Pizza, or the delish Veggie Pizza! You know those things that seem to go with almost everything? 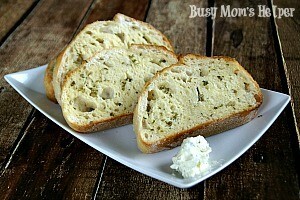 I think garlic bread is just that…it goes with pastas, pizza, some salads. Sometimes before the meal or with it. So versatile, and absolutely delicious! My go-to recipe is this Best Ever Pony Express Pizza Garlic Butter! If you saw yesterday’s Creepy Mini Pizzas post, you read about how I grew up in a store called Pony Express Pizza. My folks owned it, and they served the best pizzas around (even though they stopped over 16 years ago now, people in town STILL ask for the recipes!). It was so fun learning how it all worked, ‘helping’ around the store, and of course taste testing! I still remember they’d make these huge tubs of their garlic butter, and I would beg for some with each batch because it was the most creamy, delicious stuff ever! As I grew up and moved away, I tried so many times to repeat the flavorful goodness of this recipe, but it always ended up a total fail. Then when my family visited in September, my Dad made sure we took the time to remake the RIGHT recipe with huge success! Yup, it was as amazing as I remember it to be, and now I make it all the time for my kiddos! Thanks, Daddy! In a stand mixer (or by hand, if you really must) combine all of the ingredients and whip until it’s doubled in size. Store in an airtight container in the fridge. The flavor is best after the 1st day, after all the ingredients have really come together. Note: It also freezes really well, so make a larger batch and store some for another time! So awhile ago I went to a neighbors for one of our friend’s going away parties. 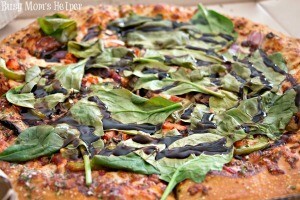 She had such a great assortment of tasty treats, but my absolute FAVORITE was this super delicious Veggie Pizza. I practically begged her for the recipe, which she so wonderfully shared. I didn’t realize it was So. Dang. Easy! Seriously, I now make this all the time. The kids eat them like there’s no tomorrow, which is a definite bonus! Spread out the crescent roll dough onto a sprayed pizza pan. Bake for 10 minutes. Allow to cool completely; you can use this time to prep the veggies and spread! In a bowl, mix the Cream Cheese, Mayo, Dill Weed, and Onion Powder. Spread over the mostly cooled crust. 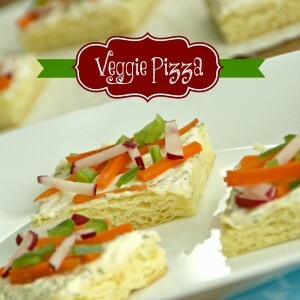 Top with desired veggies, cut into squares (or whatever shape you want), and SERVE! Be warned: These won’t last long, they’re SO GOOD! Have you noticed by now that I really like pizza? Between my folks owning a Pony Express Pizza while I was younger, and then working in a Papa Murpheys while in college, it’s just always been there for me. It’s delicious, versatile, and EASY. Oh, and especially cost-effective if you make your own (yes, we order it out sometimes, sorry)! Put all of the ingredients in a medium saucepan over medium heat. Stir well. Bring to a simmer, then reduce heat to low and simmer about 15-20 minutes, stirring occasionally. Preheat oven (and pizza stone, if using) to 375 Degrees F.
Brush some olive oil along the edges of the circular dough, to prevent burning. Spread the sauce evenly over the rolled out dough, about an inch from the sides. 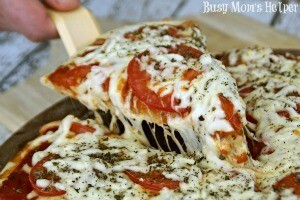 Top with a layer of cheese (Mozzarella is what I prefer) – I do about 1 cup here, but base it on your own preference. 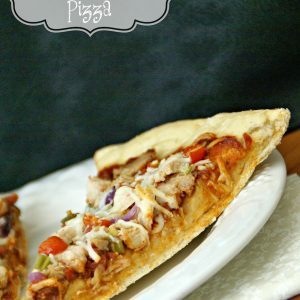 Add other toppings: Chicken (cooked) pieces, bacon bits, green onion dices, red onion dices, tomatoes…up to you! Then top with another good layer of cheese – I do about 1 1/2 to 2 cups here. I like cheese!!! What other types of pizza recipes would YOU like to see here? While I was little, probably up until I was 11-ish, my parents owned a local pizza store. I remember spending summers there ‘helping’ out, playing in the back office, watching them all make these delicious pizzas. 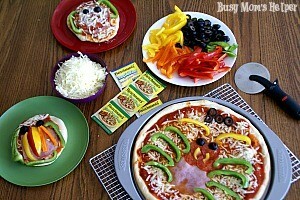 I thought I was ‘the coolest’ because my parents would arrange for a huge pizza party for my school classes. Those were fun times! Anywho…this Chicken Alfredo Pizza recipe is NOT from that pizza store, unfortunately, but it is still super delicious and one of Hubby and I’s absolute favs! The alfredo sauce has just a bit of a kick to it, really making this a fully flavorful pizza! Preheat oven to 375 Degrees. Spread a bit of Cornmeal over the pizza stone, then place in oven to preheat. Add the Red Pepper Flakes (adjust based on your desired ‘kick’) and minced Garlic, cooking about 1 minute or until fragrant. Mix in the Flour; cook until light tan in color. Mix in the Cream, reduce heat and simmer until thickened, about 2-3 minutes. Add the Parmesan, stirring until melted in, then remove saucepan from heat. 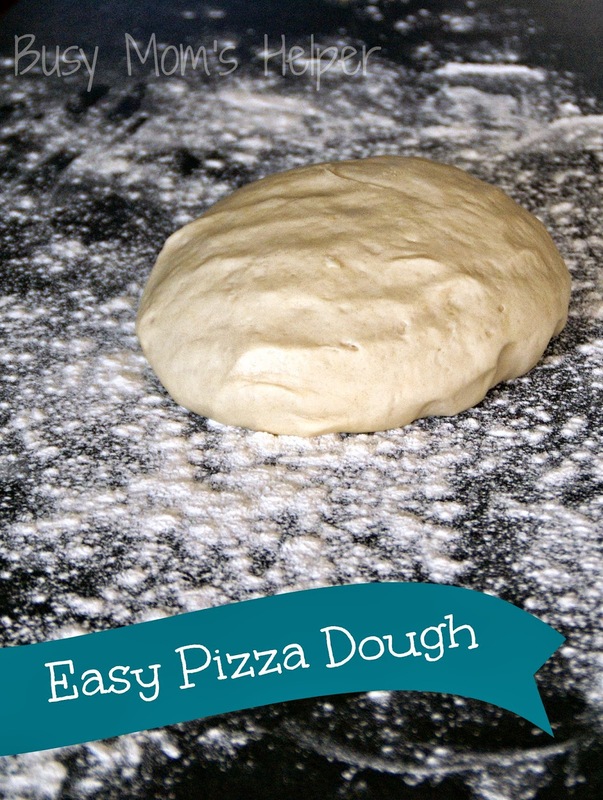 Spread some flour on your work surface and roll out the Dough until it’s about a 13-inch diameter. Being very careful, remove the pizza stone from oven. Sprinkle a bit more cornmeal on the bottom of the pizza dough, then place it on the hot pizza stone. Spread the sauce over the pizza, almost to the edges, then cover with about 3/4 of the Mozzarella. Top with the Chicken, Tomatoes and the remaining Mozzarella, then sprinkle the top with the Basil. Use a basting brush to lightly spread Olive Oil on the edges of the crust (helps prevent burning). Place in the oven (remember the stone is hot, so be careful), and bake about 20-25 minutes, or until the crust has turned golden brown and the cheese is all melted. Remove and slice as desired. Enjoy!! !